India.Arie was in Chicago on Thursday, October 12, on a mission to "spread love and healing in the form of words and music." 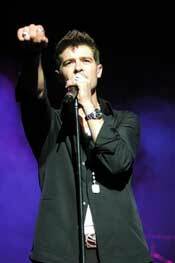 Just before she did so at the famed Chicago Theatre downtown, Robin Thicke spread his messages as well. He provided India.Arie fans with the sounds of his new album "The Evolution of Robin Thicke" and was very well received. Robin's distinguished Timberlake-esque dance moves and gyrating choreography made for an awestruck audience. Gaining new fans and pleasing his current followers with his hit "Wanna Love U Girl," the star left the crowd roaring for more. During the break, fans settled in awaiting India.Arie's performance, admiring the theatre's interior intricacies. Softly lit, the elegant surroundings were a gorgeous backdrop to set the scene for what would be a beautiful presentation. All eyes were on stage when the lights dimmed and the band and backup singers took their places. 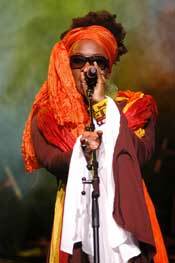 India emerged from backstage wearing a earth-toned flowing outfit accessorized with an orange head wrap and sunglasses. She broke into "I Am Not My Hair," shedding the sunglasses and robe giving way to a delicate looking wrap dress with full sleeves. And of course, the applause grew still when her head wrap came off to show India's short natural haircut streaked with rust colors. As the crowd quieted, India thanked everyone profusely for being there, a habit she continued throughout the show to indicate her humble nature. The musician sat down at her keyboard to play the "Intro: Loving" on her latest Motown CD "Testimony Vol. 1: Life & Relationship." Next, India broke into "These Eyes," and followed with "Private Party" to get the crowd jumping. During this hit, India shed more of her layers to finish the show in all white except an Egyptian styled wrap around her waist bearing gold sequins jewels that flickered when she danced. The move sent the crowd into resounding appreciation of the celebration of sound and self that it signified. After performing her remake of "The Heart of the Matter," the singer took a moment to give props to other artists she favored. India took a seat with her guitar to feel more at home and sang portions of Bobby Caldwell's "What You Won't Do For Love," Ne-Yo's "So Sick," and a very sultry version of Gnarles Barkley's "Crazy." India also shared plenty of stories, including her trip to South Africa and the meeting with Nelson Mandela's influence on her song "Wings of Forgiveness". She also noted the press' interpretation of her as "unrealistically optimistic." India challenged this analysis by offering a moment of silence, during which audience members silently forgave situations in their lives. This sparked many looks of appreciation and revelation throughout the crowd. Moving on with more of her songs, India went "Back To The Middle" from her "Acoustic Soul" album and made the crowd go crazy with "BrownSkin". She also sang "Redemption Song," providing her own accompaniment with the flute and guitar notes taught to her by Ziggy Marley. When all was sang and done, India left the stage, only to return to sing a tearful encore of "Ready For Love." She quietly left the stage having touched listeners with her very positive perceptions. So much passion is packed into one India.Arie performance. She sings with her whole soul, sometimes with eyes closed, and always with a beautiful vocal range. Passion, positivity and forgiveness were the things I walked away from the concert with. I think if everyone lived life a little more like India.Arie sings about it, the world might be a more friendly place. The meaning behind her songs are evidence that she was meant to sing and make music and her live performance is just as impressive as her recordings.